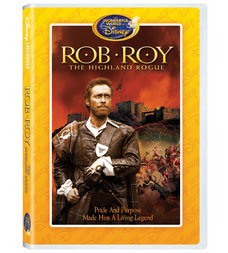 The 1995 release of Rob Roy is rated R, but the 1953 Walt Disney film Rob Roy: The Highland Rogue is quite appropriate for children, and besides exposing them to magnificent scenery in Scotland and England will also acquaint them with the legend of Rob Roy MacGregor and the early 18th century Scottish rebellions. Rob Roy is the leader of a Scottish Highland clan who rises up in the struggle against the ruling English monarchy and is eventually outlawed and hunted by the English. Although certainly not a historical documentary, viewers will understand the attitudes and conflicts of the time as well as be entertained by sword fighting, swashbuckling, and lots of action. Even the musical score is not bad.